I jumped on this bandwagon a little late in the game- silly work schedule. See, I bought this koi quilting cotton maybe a year ago that I knew I wanted to make into a skirt…later, maybe 4 months ago, I bought the Cambie pattern and put two and two together. Some of you know how much I thrive on deadlines and this sew-along was the perfect thing to get my first (yeah, hard to believe) Cambie done! 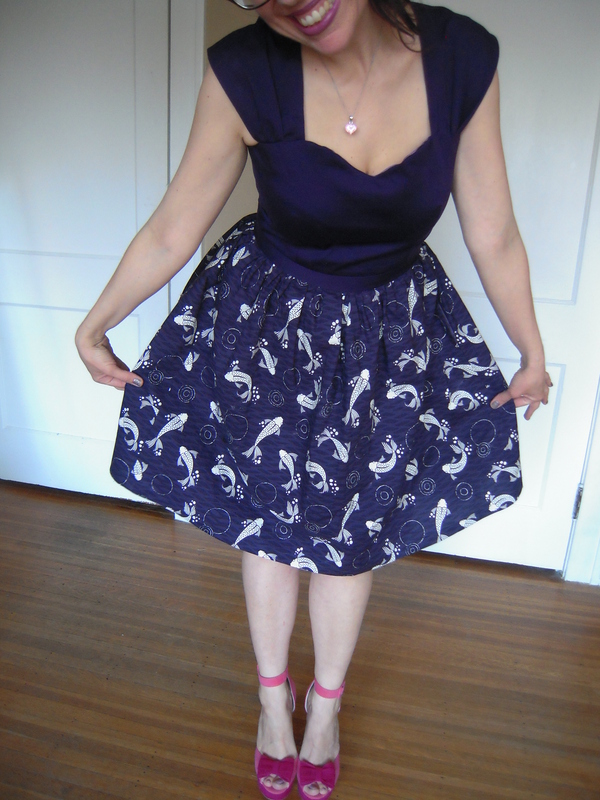 The eggplant bodice is made out of a gorgeous sateen I bought in town at The French Seam. 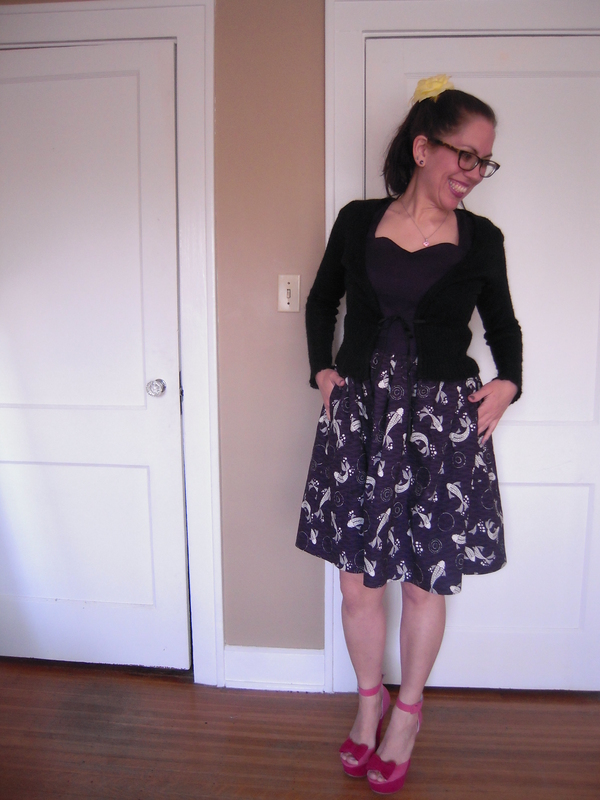 I muslined a straight size 10- no alterations- and while an FBA on a size 8 would fit like a glove, I was going for a quickie and I still think the fit is really good. 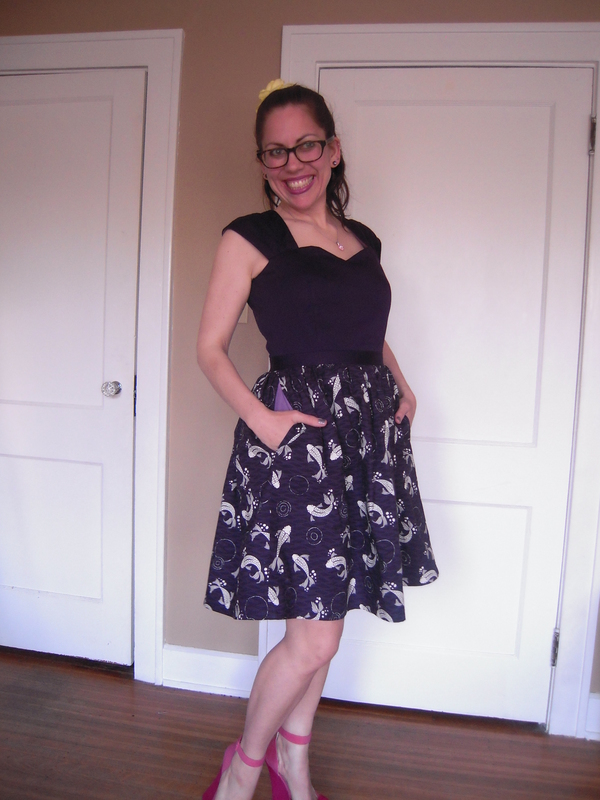 The skirt is forgiving because it’s gathered… you all know the beautiful drafting Tasia does so I’ll just show you pictures and tell you I already have another Cambie in mind- with a sushi quilting cotton I bought what seems like eons ago! I’m thinking black for the bodice…unless I can find a red sateen that matches perfectly with the sushi fabric. Thank you Sarah over at Rhinestones and Telephones for orchestrating this- you are amazing! Don’t forget to check out all the amazing dresses in the Flickr Pool! My best wishes to Roisin and Nic!!! Super cute Leila, you’re going to love wearing it! Thank you! Can’t wait for some sunny weather! Love the fabric! The neckline is beautiful with and without the cardigan. Perfect fun shoes as well! I didn’t know how much I’d love this neckline! I think it would also be cute as a top, just leaving it without the skirt. I think it would look like a pattern from Named that I’ve been eyeing. oh yeah. I thought I was supposed to get that one…but I don’t think I got everything from supporting that kickstarter. I was just telling Heather (knitnbee) that she needed a fish dress to go with her birthday jewelry. She may need to steal this from you. 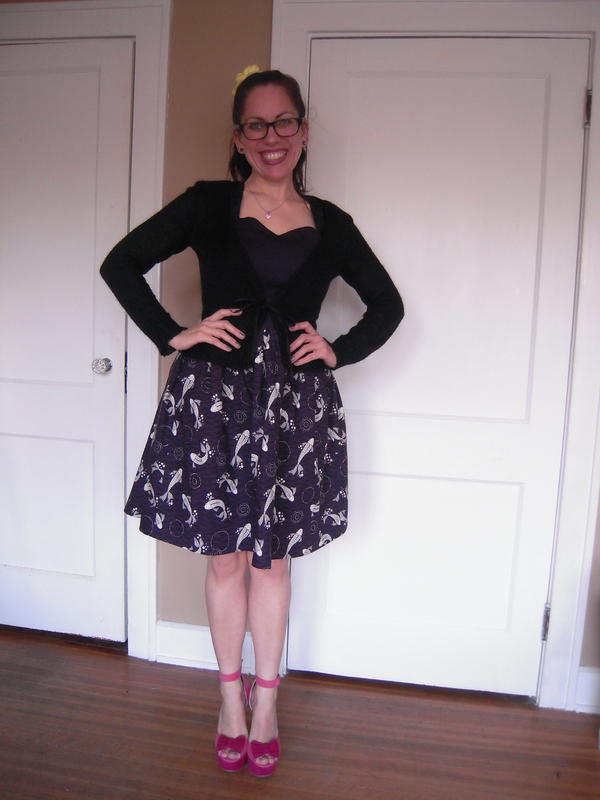 Fabulous – such a great pattern & looks perfect on you! Love, love, love this dress. Did I tell you I love the dress? Koi prints are my favorite fishy style prints and I really like the solid/print combo. Thank you for noticing the taming of the koi. I didn’t want all koi though I’m sure it would look really nice, too. So cute! I love that fish fabric. Love it, and that print is fantastic! This is super cute — that last gif!. And now you can say “My friends say I’m very coy…” a la Bugs Bunny. haha!! I think I just might use that line. I love a good pun. And I love gif’s! haha Couldn’t help myself. Very inspired fabrics and perfectly fitted! And you look gorgeous. I’m glad you enjoyed the gif. All for you! !